The fourth commission meeting, under the Turkish Presidency and the Seminar on the “Security Risks and Human Challenges for Illegal Immigration through the Mediterranean” were held in Amman, Jordan from 24th to 27th of June, 2018. During the Service Organization Commission the admission processes, amendments on the FIEP Statute, development of FIEP official website and some cooperation projects were discussed. In addition, the final activities for the 2018 Presidency and the preparations for the 2019 Presidency including proposals of general theme and organization of commissions were also approached. 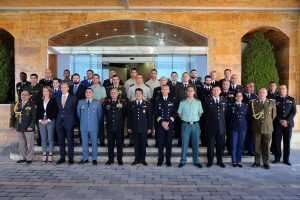 Simultaneously with the Commission the experts on immigration convened to exchange of knowledge and experience about the “Security Risks and Human Challenges for Illegal Immigration through the Mediterranean”.